I awoke at about 6am yesterday to the sound of rain on the caravan, not very heavy, but it continued for about 2 hours or so. Later in the morning it started again, this time quite heavy, and rained on and off for the rest of the day. Now compared to what was going on in Cape Town it was nothing, maybe 5 -10mm (I am guessing as nobody has an accurate measurement) compared to C.T.’s over 100mm, but it did cause quite a bit of chaos. Remember that the area round here is classed as desert and as such has a very low average rainfall of about 25mm per year. The road to Alexander Bay became like a mud bath and very slippery with the result that quite a few cars either got stuck or went off the road completely. Those that made it through to Brandkaros were covered in mud to half way up the windows. Some of the roads that go past here toward the Richtersveld Park became impassable and 2 guys from Springbok had to stay over here in the rondavals. The other problem that was caused, with all the damp, was a localised power failure. They get so little rain here that there is not a lot of maintenance done on all the outside light covers or in the camp site office. I had a look and found that water was dripping down exposed wiring in the toilet. Not very safe!!. None of the electrical boxes, that the campers plug into, even have earth leakage. Anyway they managed to get hold of an electrician from Alexander Bay to sort some of it out. He had a hell of a job getting here and said he nearly went off the road a couple of times but at least I had electricity and could keep nice and warm and the fridges going. I had been wanting to go to Alexander Bay yesterday to get some fresh supplies of fruit, bread etc. but decided against it because of the road conditions. I was hoping that when I woke up this morning that the sun would be shinning and I would be able to go in this afternoon. Unfortunately it is still overcast and could even rain again later, so no go. Will just have to make do with what I have. I did bump into Analine, who manages the camp site, and she had baked me an enormous loaf of brown bread. I have had a few slices and it is delicious. 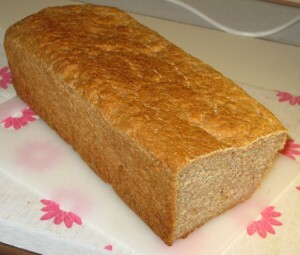 Delicious home baked brown bread. 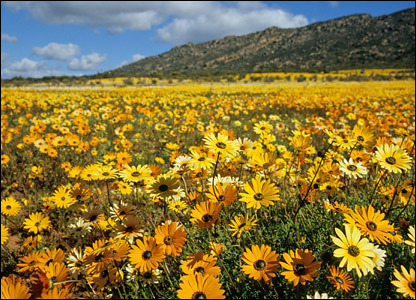 I am sure that after all the rain it will be a bumper year for the Namaqualand Spring flowers. I hope that by the time I start my journey back to Cape Town, late August, that the flowers will have started to bloom. I remember 40 years back, when they had a bumper year of flowers, it was spectacular. Mile after mile of flowers for as far as you could see. If this is a really good year I would recommend, to all who can, to go into the Namaqualand for a week-end. It will be well worth it. Oh I remember the excitement when rain fell in the Northern Cape! I loved it! That bread looks delicious… I hope you can get supplies soon! @Hanlie It not only looks but also tastes delicious!! Am going in today to get supplies. Also want to do some more photo’s of the town itself. Sjoe! Hope you manage to get the supplies you need today. @JustBcoz Tell you what the people up here are so nice and friendly. She and her husband, Apie, have kind of taken the “Engelsman” under their wing. @Brendon I am really hoping that by the time I leave Namaqualand the flowers will be in full swing. Everyone up here thinks it will be a bumper year. Wonderful website and explicit this post, also with DR-WebSpyder displayed well.